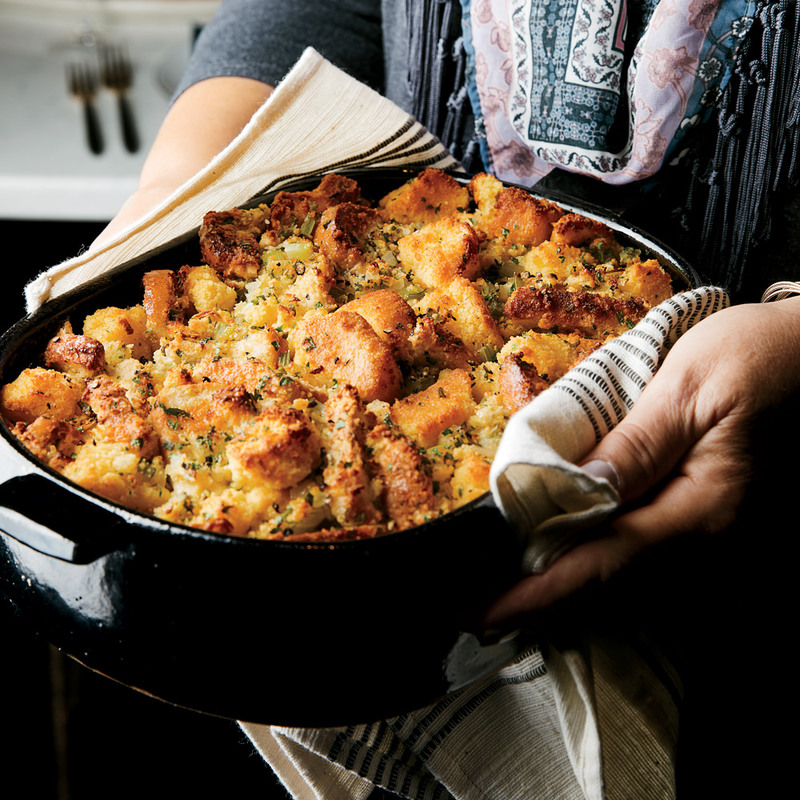 Top Chef winner Kristen Kish’s mom came up with this two-bread stuffing to please both sides of her family: half from Michigan, where white bread stuffing is essential, and half from Texas, where they demand cornbread. A double batch feeds a crowd with plenty of leftovers for the next day. Preheat oven to 350°F. Grease 2 (13- x 9-inch) baking dishes with butter. Heat oil in a large skillet over medium-high. Add onions and celery, and cook, stirring occasionally, until softened but not browned, about 10 minutes. Add sage and garlic, and cook, stirring often, until fragrant, about 2 minutes. Transfer cooked vegetables to a large bowl. Add cornbread, sandwich bread, parsley, salt, and pepper; stir until well combined. Gradually stir in stock until breads are evenly moistened. Scrape mixture into prepared baking dishes. Bake in preheated oven until hot and lightly browned, about 30 minutes.